The application of post-emergence herbicides to succulent peas must be made at certain growth stages. Herbicide labels often refer to peas at a certain number of nodes (point where a leaf meets the stem). 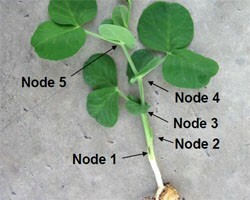 In peas, the first two nodes have only scale leaves and are often below the ground. These should be counted in green peas. (Note this is different for dry field peas.) Furthermore, afila (leafless) peas do not have true leaves, rather they have stipules and tendrils. Learn how to properly count nodes in succulent green peas below.